Introduced to me about 3 years ago by Jim, Electronic Catch Phrase is an easy-to-learn and entertaining party game for small to large groups. Game play often involves two teams sitting every other one with each team alternating the phrase guessing as the time counts down. 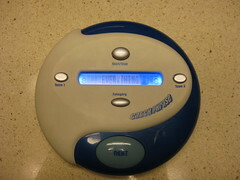 The electronic version is shaped like a small disk and essentially becomes a “hot potato” as each team tries to guess the phrase and pass the disc before the buzzer sounds. Having played hours and hours, we have added a few additional instructions to aid game play and reduce debates for more competitive players. BUZZER NOTE: The buzzer sound does not necessarily mean the point has been lost. The guessing team must hit the Next button and cause the word to change before the opposing team loses a point. ETIQUETTE: A team must provide at least one clue before passing to the opposing team. This situation commonly occurs when the disc is being passed as the buzzer is sounding. The phrase changed, but the next person did not have time to say anything even though they are holding the disc. STRATEGY TIP: Many clever beginners will delay the disc handoff in an attempt to shorten the time for the opposing team. Most experienced players realize this is a futile effort. Beyond being unsportsmanlike, this strategy often backfires because the next phrase may be quickly guessed by the opposing team leaving the perpetrating team with less time. Can the clue giver repeat a word in additional clues to his partner if his partner has already said the word? Great question! Unfortunately, the clue giver cannot say any words or parts of the words, even if his/her partner has said them while trying to guess. Since gesturing is allowed, it’s sufficient for a clue giver to gesture to a partner when the partner has mentioned parts of the word. Using the classic Charades method of signalling how many words are in the Catch Phase, the clue giver should be able to gesture which word the partner has guessed correctly. We have an argument concerning the “next” button. Some say the guessing team can’t use the “next” button if they don’t like the word. Others say it doesn’t matter since the countdown is still going. No rule to go by? A good question with a variable answer. When playing with kids, we suggest allowing one free “next” per turn to give younger people a better chance as they may not know the meaning of many words. This is not a rule, but we’ve found it improves the game when kids and some teens are playing. When playing with adults, no free “next” is allowed as there is a way to use syllables to guess any word, even if the clue giver does not know the meaning. To allow unlimited changing of the words during a turn would greatly diminish the challenge of the game and allow the clue giver to always shift towards simpler words to get rid of the disc, effectively creating a game of chance and less about skill.